To give a better look to your recipe, you can use different types of colors. Most widely used are light yellow (can use turmeric powder), orange (kesari powder) or red. These will be available in any grocery stores. Make sure that these colors don’t have any essence, as it might finally effect your final recipe. Head of big fish is used in many recipes in Bengali cooking. 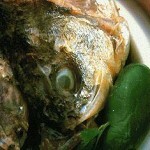 Fish head is like a delicacy. Use Rehu, Hilsa for making chanchra. Substitute Rehu for Grass Carp or buffalo. Fish sauce is the single, most important flavoring ingredient in Thai cooking (also well-loved in Laos, Cambodia, Vietnam, Burma and the Philippines). Used like salt in western cooking and soy sauce in Chinese cooking, good-quality fish sauce imparts a distinct aroma and flavor all its own. 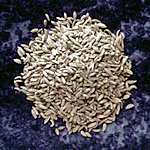 Fenugreek seeds ( Methi) are used as a spice. They have a bitter taste and flavor and should be used sparingly. Used for seasoning dal and some vegetable. The fresh green leaves are cooked and eaten as spinach. French beans are long green colored type of beans — one of the type out of varieties of different beans which are available. Buy only bright green color, crisp and not very strong or hard ones.